The boat capsized off Libya. File photo of migrants attempting to disembark a ship in Italy. SEVEN HUNDRED PEOPLE are believed drowned after a fishing boat smuggling migrants to Europe capsized off Libya. Only 28 people survived the capsize, UNHCR spokeswoman Carlotta Sami told the Skytg24 news channel in Italy. The survivors indicated there had been more than 700 on board, she said. It seems we are looking at the worst massacre ever seen in the Mediterranean. The incident triggered fresh calls from Pope Francis and others for European leaders to act over what many see as an avoidable loss of life. The European Union announced an emergency meeting of foreign and interior ministers to discuss what Amnesty International blasted as a predictable “man-made tragedy”. The Maltese navy put the numbers on board at around 650 and said an alert had come in around midnight on Saturday. The tragedy is the biggest in a growing catalogue of mass drownings of migrants attempting to reach the European Union on overcrowded, unseaworthy boats run by people smugglers. The boat went down about 96 km off the Libyan coast and 193 km south of the Italian island of Lampedusa. Coastal authorities in Italy and Malta picked up a distress signal from the stricken vessel around midnight (10pm GMT) on Saturday, when it was about 126 km off the Libyan coast and 177 km south of the Italian island of Lampedusa. 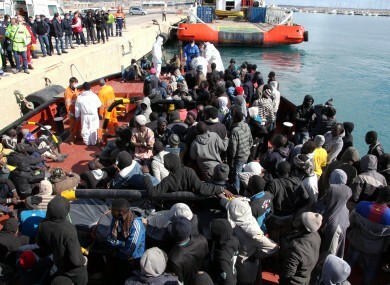 The Italian coastguard instructed a nearby merchant ship to provide assistance and it was when the Portuguese-registered King Jacob arrived at the scene that the fishing boat capsized, most likely as a result of the terrified passengers stampeding to one side in their desperation to get off, the UNHCR’s Sami said. A total of 17 boats scoured the area for survivors today but only 24 bodies had been recovered by late afternoon, the coastguard said. EU foreign policy chief Federica Mogherini, a former Italian foreign minister, said Sunday’s events were a stain on Europe’s conscience. We have said too many times ‘never again’. Now is time for the European Union as such to tackle these tragedies without delay. This disaster confirms how urgent it is to restore a robust rescue-at-sea operation and establish credible legal avenues to reach Europe. Otherwise people seeking safety will continue to perish at sea. These latest deaths at sea come as a shock, but not a surprise. The disaster comes after a week in which two other shipwrecks left an estimated 450 people dead. More than 11,000 other would-be immigrants to Europe have been rescued by Italy’s coastguard and other boats. Some 1,500 migrants have now drowned in the waters between Libya and Italy since the start of the year. Email “Stampede by terrified passengers may have led to 700 deaths in shipwreck”. Feedback on “Stampede by terrified passengers may have led to 700 deaths in shipwreck”.